Easley High School is happy to welcome Caleb King as the new head football coach of the Green Wave. King is coming to Easley from Havelock High School in North Carolina, where he built the highest scoring offense in the state and finished the 2018 season with a 13-1 record. “Coach King has a record of success at each stop in his coaching career, and a very bright future. Now I’m thrilled that his future includes Easley High School,” said Gill Payne, EHS athletic director. His success on the sidelines has earned him multiple opportunities for leadership in the coaching community. 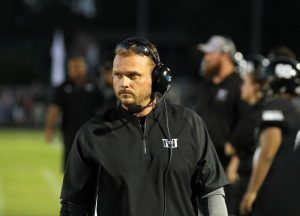 His articles have been published in American Football Monthly and Nike Coach of the Year Clinic Manual, and he has been invited as a Clinic speaker at NCFCA, Nike COY Clinic Charlotte, Nike COY Clinic Atlanta, UNC Football Clinic, Auburn University Football Clinic, Glazier Mega Clinic in Charlotte, and Virginia Coaches SW Clinic. Before beginning his head coaching career, King was defensive coordinator at Havelock High School and an assistant coach at West Craven High School. He holds a Bachelor’s degree in History and a Masters in School Administration, both from East Carolina University. Coach King, his wife Jenna, and his children Caden and Scarlett will be relocating to the Upstate this summer.